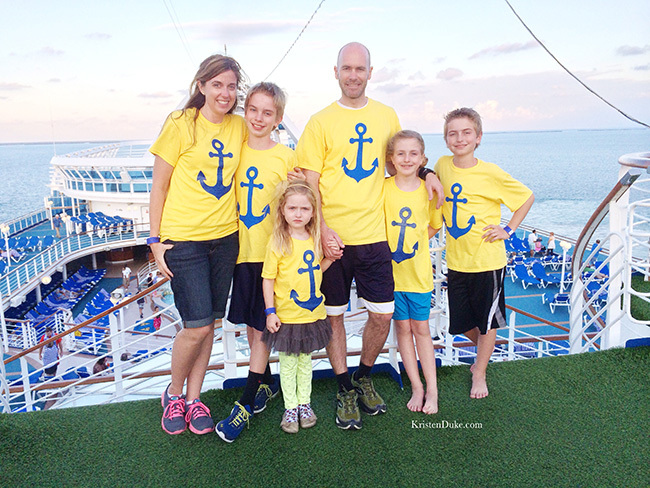 I’ve had lots of people ask about the anchor shirts we wore on our family cruise in January. I was so very happy with how they turned out, having been a first for me. So here is a little how-to. It was quite easy, though it took some drying time in between layers. I used a sheet of vinyl as my template. It sticks to the surface and makes it perfect to not go outside the lines. I have a vinyl cutting machine, so I was able to pick my design and make quite the perfect shape, but if you don’t have a machine, you can trace your shape and cut it out with scissors or an exact-o-knife. You can purchase a sheet of vinyl at your local craft store, or even a roll of it, or online. The color of the vinyl doesn’t matter, as it’s just your stencil. I used purple. 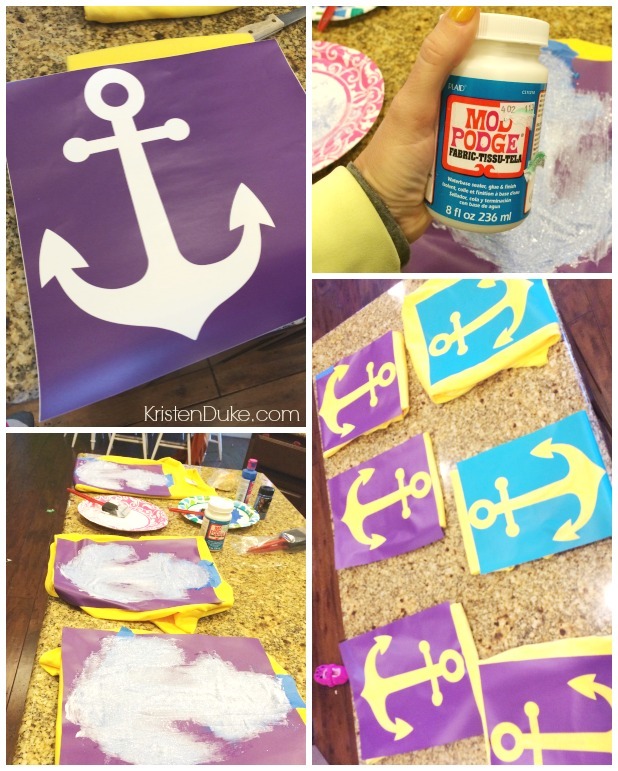 First, using the fabric paint, I painted inside of the anchor. After letting it dry, for the BOYS, I just painted on a second layer, as they weren’t going to get the glitter. If you don’t want glitter, you can stop there and peel off the vinyl. For the girls, I wanted a little bit more glamour, so took a risk with a method I’d never used before. I found blue glitter that was very similar to our blue paint, so I was VERY excited to use it! When I painted the second layer, right after, I sprinkled glitter all over. I wanted it to stick to the wet paint. I was very generous with my glitter sprinkling, as I wanted it to cover every surface area. I tilted the shirt around a little to make sure it got every nook and cranny. I then waited for that to dry, before applying the fabric mod podge layer to seal it in. I then slathered on the fabric mod podge, and I was happy that the glitter didn’t seem to come off, it was stuck to the paint pretty well. After that dried, (I let it sit 24 hours) I peeled off the vinyl template and voila! 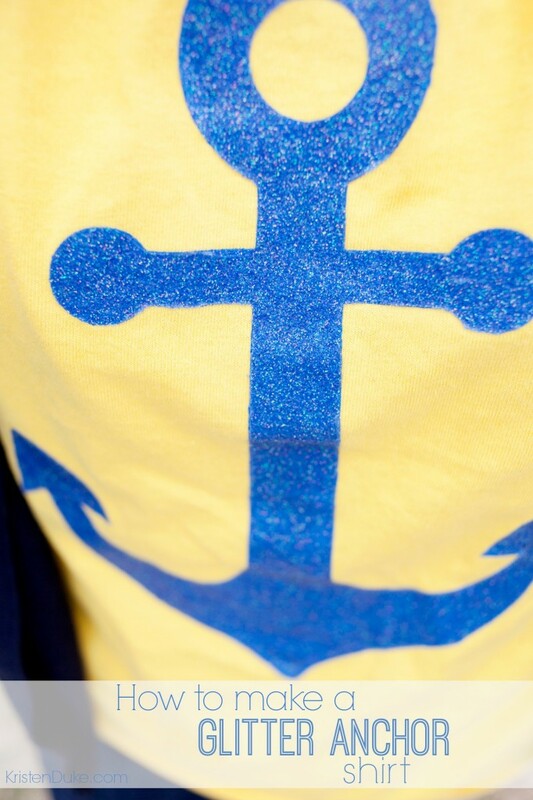 I had my glitter anchor shirt! I am very very pleased with how it turned out! I’ve now washed them several times and it’s stayed just great. 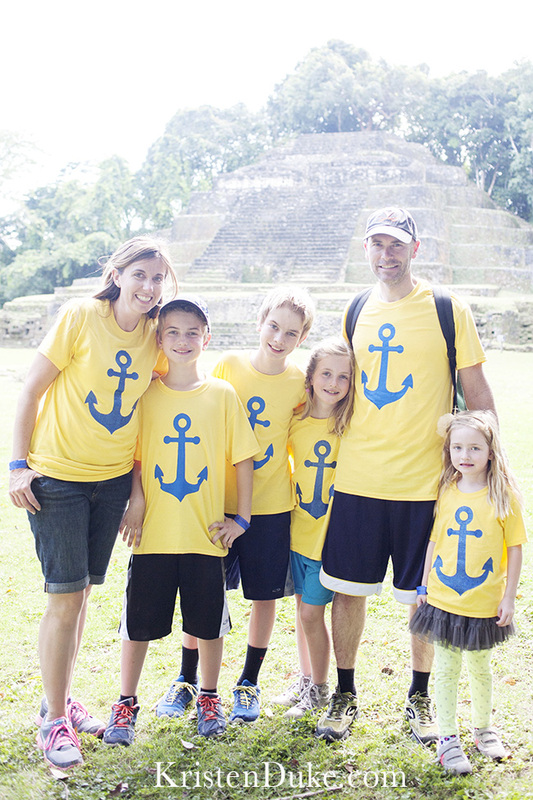 It’s nice and thick off of the shirt and is such a great texture for any shape or design.